HTC is planning to unveil yet another flagship smartphone, HTC U in coming months. 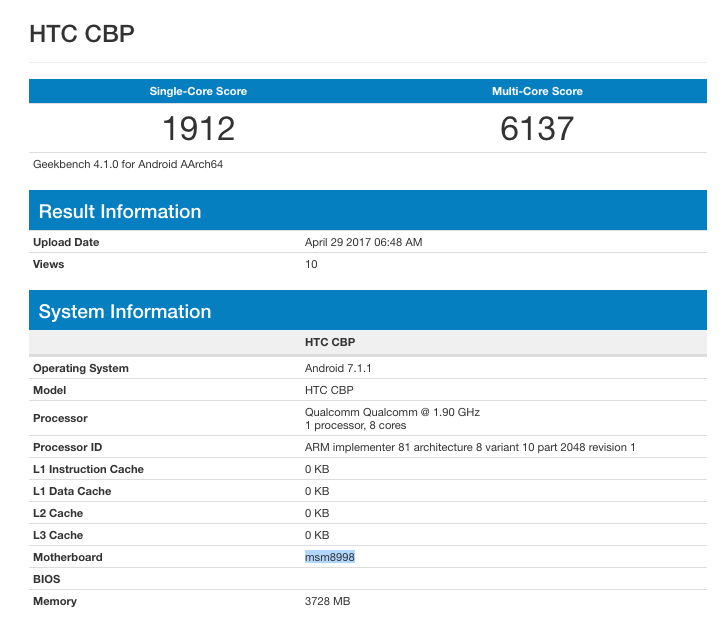 After appearing on Antutu, the upcoming phone with a codename HTC CBP has now appeared on a benchmarking site, GeekBench. The phone will be powered by an Octa-Core Snapdragon 835 chipset coupled with 4GB of RAM, confirms the GeekBench listing. Apart from this, the phone will run on Android 7.1.1 Nougat. Considering previous leaks and benchmarks, the HTC U will sport a 12-megapixel rear camera along with a 16-megapixel selfie camera. Battery size of the phone is still under wraps. The phone is expected to harbor a 5.5-inch display size. However, the phone display will flaunt a QuadHD resolution. Storage-wise, the phone will come with 64GB of native storage. Security-wise, the device is protected by fingerprint and password locks, and web traffic encryption via VPN is possible. P.S : You’re reading it first on GeekySplash !